Find out what garden snakes eat. You might be sharing your garden with a snake and not even know it. There are both advantages and disadvantages to having these slithery reptiles hanging around. You can either attract them or, if you prefer, discourage them from moving in. There are actually 2,000 different kinds of snakes, but they all share some common characteristics. All snakes hunt prey to eat. Some species are downright poisonous, which is a hazard to the gardener. A snake hunts with its senses. Whether it uses its nose, tongue or sense of touch, a snake finds its food with a keen sense of smell and the ability to feel the body heat of another animal. Snakes hibernate underground in the winter. Since they are cold-blooded reptiles, snakes must lie in the sun to keep warm. All snakes shed their skin as they grow. 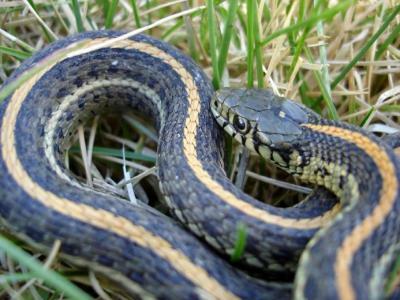 The most common garden snake is the non-poisonous garter snake. This species is found throughout most of the Americas and can live in a variety of climates. It loves ponds, wetlands, forests, fields and even your yard. This snake is best identified by its long, horizontal stripes that run the length of its body. - the most common being three yellow stripes. 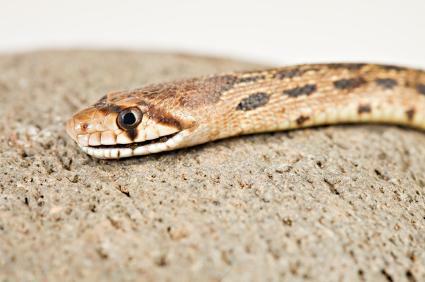 A fairly small snake, garters eat small animals such as earthworms, frogs and fish. These snakes sometimes become food for other animals as well, like owls or raccoons. Garter snakes hide when they're afraid. They give birth to live babies in the summer. Although these snakes are relatively mild natured, they have been known to bite a gardener who picks one up to show off to her kids. Non-poisonous gopher snakes are often mistaken for poisonous snakes like rattlers. Although they do bite, they leave nothing more than a mark. As their name implies, these snakes eat small animals like gophers. They are a burrowing snake, but are sometimes found hunting on the ground or even in trees. The deadly poisonous rattlesnake is one of the most feared snakes around. Rattlesnakes can easily hide in sand or leaves because their camouflaged skin blends in so well. Luckily, this snake gives off a warning signal by rattling his tail whenever an intruder gets too close. If the warning isn't heeded, the snake will bite. 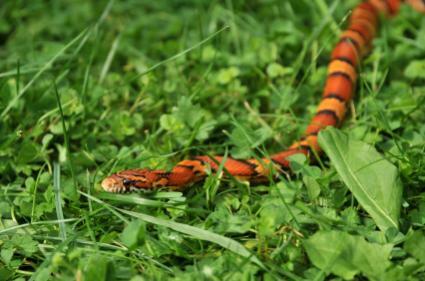 Non-poisonous corn snakes have red patches that are edged in black and set against an orange-tan body color. They are constrictors, and they prey on small reptiles and rodents, as well as birds and their eggs. Whether or not you particularly like snakes, there are some good and bad points to having them take up residence in your garden. It's up to you to decide if the good outweighs the bad. Snakes can actually benefit your garden. They'll eat slugs and bring down the Japanese beetle population in your yard. Some snakes will even eat small rodents that might otherwise feed on your flowers and veggies. When you look at it that way, it can make sense to try to attract a few snakes to your yard. If you decide you'd like to do that, you can take the following steps to make your garden more hospitable. Create a snake haven by piling some large rocks together. The snakes can hide under and around the rocks, and they can warm themselves on the rocks on sunny days. Plant some ground cover for the snakes to hide in. It will make them feel more secure. Try to keep pets and other animals out of the garden that might prey on the snakes. The main disadvantage of having snakes in your garden is that they will bite if you accidentally disturb them and they don't have an easy exit. 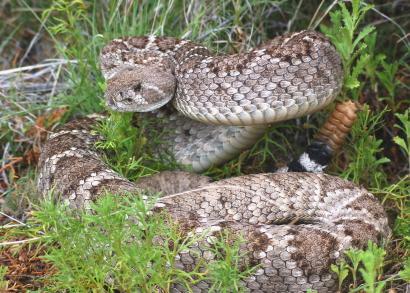 While many of these snakes are not poisonous, the rattlesnake's bite can be fatal without swift medical intervention. Snakes also don't distinguish between bad insects and beneficial bugs. They'll eat whatever is available. If you decide the disadvantages outweigh the advantages of sharing your garden with a few snakes, simply make the habitat less inviting. Clear any garden clutter, including woodpiles, fallen leaves and discarded pottery that can offer the snakes a place to hide. Use a live-catch trap to remove small rodents. Capture slugs by setting out shallow saucers of beer that will attract them into the dish to drown. Snakes are quite adept at hiding because they blend in so well with their environment, so most gardeners never actually see them. They only spot signs of their presence like discarded skins left behind. In most circumstances, these snakes will slither away if you disturb them because they fear people and larger animals. As long as a particular snake isn't poisonous, it's usually best to just leave it alone. It will move on once the food supply in your garden is exhausted. If there ever comes a time when you want the snake removed, it is usually best to hire a pest removal service. The risk of tampering with the animal is simply not worth the effort, especially if the snake really is poisonous.